A twist on a well-loved classic, where the fish speaks for itself. Try serving it in traditional style with grilled cheese toasts and rouille. Heat the oil in a large saucepan or casserole dish over a medium-low heat. Add the garlic, onion, chopped fennel and celery and cook gently, stirring often, for 12-15 mins, until the onion is nice and soft. Add the fennel seeds, paprika, star anise, chilli and saffron and continue to cook for a further 5 mins. Add the white wine, bring to the boil then throw in the tomatoes with their juices, and bring to a simmer. Cook gently, stirring occasionally for about 30 mins, then pour in the fish stock or water. Simmer for a further 20 mins. Meanwhile prepare the fish. Place the fillets on a board and with a sharp knife cut the fish away from the skin. Now cut into large pieces, and place in a bowl with the squid. Season with salt and pepper. Before adding the mussels, clean them in cold running water, discard any that are damaged or open, then drop them into the simmering soup. Cover the pan and cook for a couple of mins. Uncover, give the pan a shake, and add the fish and squid. 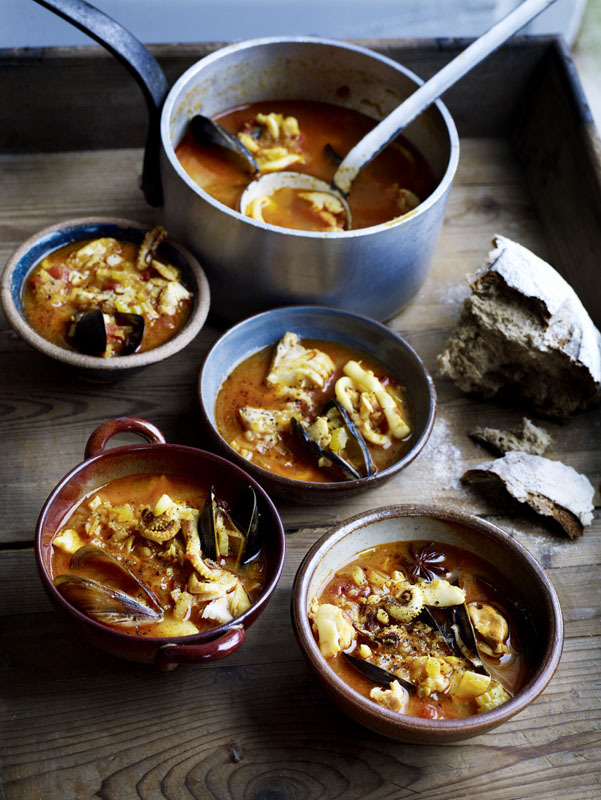 Turn in the sauce, cover and cook for 3-4 mins, or until the fish is just cooked and all the mussels are open. 6. Taste the soup and adjust the seasoning as required. Serve with good bread and a trickle of your best olive oil.